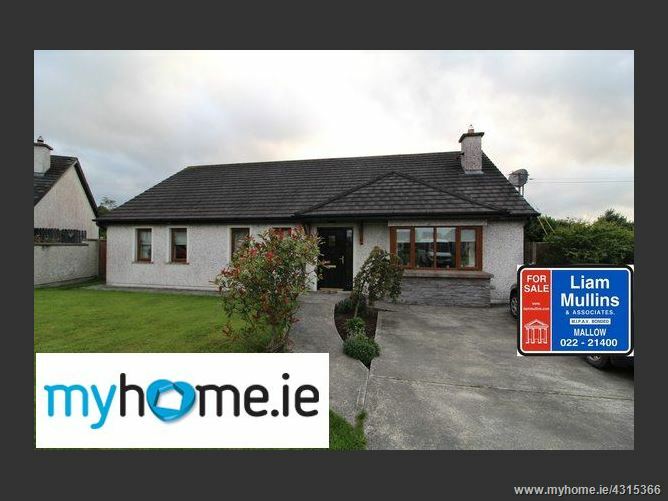 Three-bedroom bungalow within this exclusive development in the tranquil village of Lyre overlooking the Glen Valley in the Duhallow region of Cork. Comprising of Hallway, TV/Lounge, Utility, Kitchen/Dining, three bedrooms (Master En - Suite), Bathroom and hot press. Reception Hallway	16'8 x 5'2	Access to all accommodation. Kitchen/Dining Area	22' 2'' x 14' 5''	Fitted kitchen with extensive units at eye and floor level. The kitchen has an impressive tiled floor throughout. Tiled floor with patio door leading to the patio area. Utility Area	8'4 x 6" Tiled Floor. Bedroom 1 13' 7'' x 12" Built-in storage from floor to ceiling. Bedroom 2 13' 1'' x 13' 7'' The room has built-in storage from floor to ceiling. Bathroom	10' 4'' x 6' 8" Tiled floor to ceiling. Electric shower. From Cork city head out the Carrigrohane Straight and at the traffic lights at the Ballincollig End turn right. Proceed along this road passing the Anglers Rest and turn right heading for Blarney/ Tower/ Banteer/ Kilarney. Once on this road proceed for C. 16 Miles passing some land marks like The Muskerry Golf course, Tower village on your right hand side and Blairs Inn on your left hand side. After c. 16 Miles on this road you will enter the village of Nadd. After the pub which is situated on the Left hand side there is a V in the road. At the V, turn left and proceed up the road for C. 1 Mile until you reach the Development.